NeCSA Annual Meeting...the Network Continues! On Thursday, November 16 and Friday, November 17, I attended the annual meeting of the Northeastern Coastal Stations Alliance (NeCSA), a network of field stations and marine labs in the Gulf of Maine. We founded the network in partnership with Bates and Bowdoin Colleges in 2015 with funding from a National Science Foundation Field Station and Marine Laboratories planning grant. This meeting focused on revising our intertidal monitoring protocol that member stations implemented in the summer or fall of 2017. We also delved into data management and other considerations for making our data accessible for other researchers, educational purposes and to the public. Our overarching goal for joint monitoring is to be able to track changes in the Gulf of Maine across the spatial extent of our coastal stations which range from the Isles of Shoals on the border between New Hampshire and Maine to Bon Portage Island in Canada. We are in the midst of trying to figure out how to work together to collect, manage and analyze data. In 2016, we deployed temperature loggers in the intertidal and then in the summer and fall of 2017, we set permanent transect sites and collected data about the intertidal community, including presence or absence and abundance. 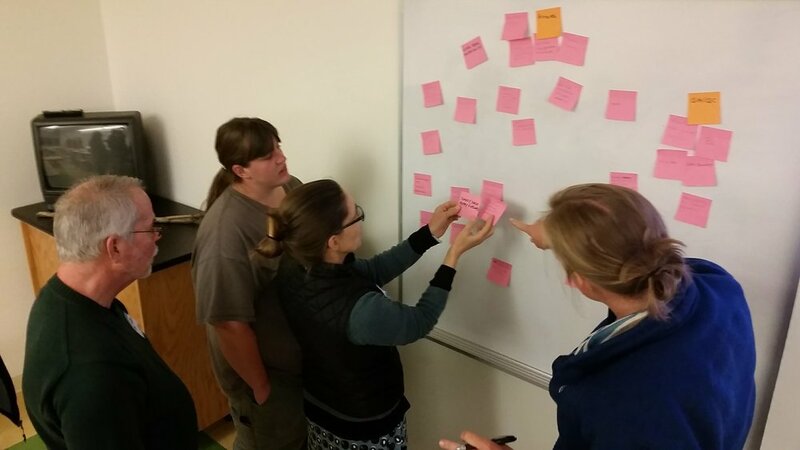 On Thursday, we discussed observations from this year’s fieldwork as well as revisions to the protocol and ideas for training individuals in identifying species and implementing the methods. Lack of man or woman-power was a major issue many of our stations faced. The transects just take time and people. We brainstormed creative ways to engage communities, students, and others in the implementation of our protocol. Schoodic Institute modified their training and data sheet for citizen scientists to head into the field and collect the data. Another potential opportunity for interesting research is to connect our Kelp Ecosystem Ecology Network (KEEN) subtidal monitoring to our NeCSA intertidal monitoring (Check out our blog post here!). The Hurricane research team already implements the KEEN protocol at three sites: Pemaquid Point in partnership with Marissa McMahan at Manomet, Hurricane Island and Schoodic Point. The latter two sites are already NeCSA monitoring sites. By linking our subtidal with our intertidal sites, we may be able to track shifts in community composition with rising sea levels or other changes in the environment. We haven’t quite figured out how to do this yet, but we’re hoping to work on it and get more NeCSA stations involved in KEEN monitoring. The meeting was a success and as always, it was fun to see everyone and hear how their field seasons went. We’re planning to meet again in March at Bigelow so stay tuned!